3-Bedroom, 3-Bath, Townhome with Outstanding Golf Views! Make your Graeagle vacation one you will never forget in this one-of-a-kind townhome! Inside this fully-furnished beauty, you'll find comfortable, over-stuffed furniture surrounding a native-rock, wood-burning fireplace and original redwood throughout creating a sense of coziness and warmth while the high ceilings upstairs make the bedrooms feel spacious and airy. Your upgraded kitchen is fully stocked with custom cabinetry and tile countertops sure to delight the choosiest chefs. Light pours in through the windows that run the length of the living and dining area which look out onto the deck and beyond to unbelievable golf views. Enjoy meals gathered around the spacious dining table or dine al fresco on your private deck. All 3 bathrooms have been recently remodeled and upgraded. 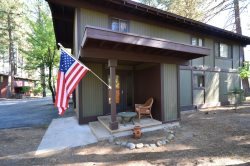 It's just a short walk to the Graeagle village or head down to the Feather River for fishing. We've been staying at the Meadows for years. We've gotten to know Dave, the manager, over the years, and he's just a terrific guy, and always greeted with a warm welcome when we arrive. When problems have come up, Dave and his staff are always courteous and work to resolve the problem quickly. We've been vacationing in Graeagle for many years, and love staying at the Meadows. For the last 6 years, we've been staying in #122, and it's a terrific place. Comfy furnishings, great beds and the kitchen has everything we need to prepare dinner. We usually BBQ in the evening and enjoy dinner on the deck. You just never get tired of the view! And the owners added a 3rd bathroom upstairs this years.